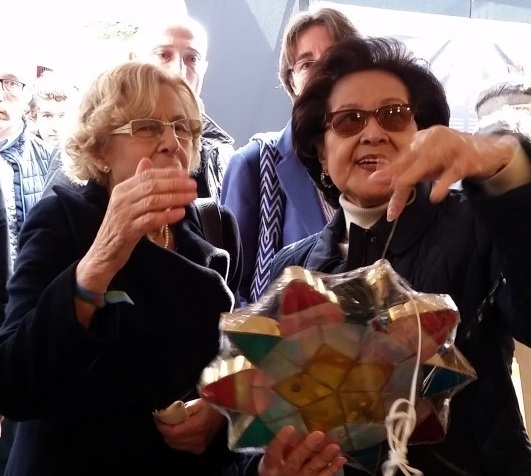 Mrs. Isabelita Salinas presents a capiz lantern to Madrid Mayor Manuela Carmena. Consul Susana Mendiola demonstrates how to make lumpia in front of a camera. 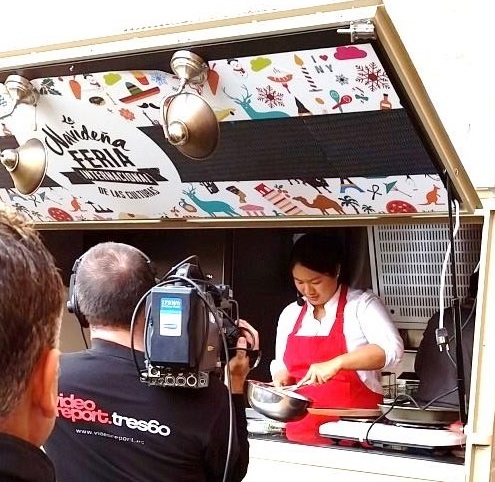 The Philippine Embassy in Madrid featured Philippine cuisine and products at the first edition of La Navideña Feria Internacional de las Culturas, a Christmas fair organized by the Madrid City Government. The fair was held from 17 to 22 December 2015 at the Cuartel de Conde Duque, one of Madrid’s three biggest cultural centers. The fair featured 50 booths by various embassies and cultural institutions and a series of performances and activities from various cultural organizations in Spain. The Philippines organized activities during the fair such as (1) a cooking demonstration of lumpiang sariwa, turon and tablea; (2) a parol-making workshop for children 6 years and up; (3) a children’s book reading session featuring José Rizal´s Ang Matsing at ang Pagong, and (4) a skit presenting Filipino Christmas traditions. In its booth, the Philippines showcased an array of Christmas décor made of capiz and sinamay. It also featured delicacies such as bibingka, ensaymada, turon, suman, polvoron, pastillas, turones de mani and taho. The delicacies were complemented by free samplings of Fundador Brandy, a Spanish brand which was recently acquired by a Filipino tycoon.